..... Click the link for more information. , class Magnoliopsida, order Campanulales, family Campanulaceae. Use sparingly, this plant is powerful. Whole plant is edible. Seeds have most powerful effect. Light purplish blue or white flowers with pointy oval leaves that are hairy underneath, and golden papery bag-like seed pods. 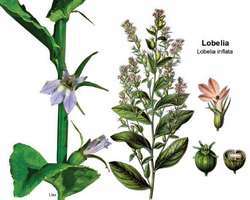 Lobelia is a healing sedative that relaxes bronchials, making it good for asthma, bronchitis, coughs and epilepsy. If too much is taken, it causes vomiting, making it a very strong expectorant and clearing mucus etc. Lobelia increases the effect of other herbs, so if for example you are sick and take echinacea, lobelia will make it even more powerful. Be careful if taking medication. Leaves taste like tobacco and contains a non-addictive nicotine-like substance called Lobeline, so chewing them helps people quit smoking since. Used to treat epilepsy, convulsions, hysteria, trauma, tetanus. It is said Indians gave this to arguing couples so they would get along again. Very strong, so take in small doses. a genus of plants of the family Lobeliaceae (sometimes included in the family Campanulaceae). They are annual and perennial herbs, subshrubs, and shrubs. The leaves are entire and alternate. The flowers are irregular, in bilabiate or monolabiate corollas, and bisexual. The stamens are united into a tube through which the style with the stigma passes. The fruit is a capsule. There are approximately 350 species of Lobelia, distributed in humid places in the tropics and subtropics of America and Africa. Fewer species are found in Asia, Australia, and Oceania; only two species are encountered in Europe. There are two species in the USSR: water lobelia (Lobelia dortmanna) and L. sessilifolia. Water lobelia grows in bodies of water in the European USSR. L. sessilifolia is found in bogs, along river banks and lake shores, on floodplains, and near hot springs in Eastern Siberia; in the Soviet Far East this species grows as a weed among rice plantings. In the USSR, Indian tobacco (L. inflata), which is a North American species, and less commonly acrid lobelia (L. urens), which is native to Western Europe, are used as medicinal plants. The aboveground parts of these plants contain the alkaloid lobeline. Some lobelias are cultivated as ornamentals. L. erinus is widely used as an edging plant and in flower beds. The Zapata bladderpod has not been verified in Mexico in recent years. The recovery plan is an important tool for private landowners who may be interested in contributing to Zapata bladderpod recovery, and it will stimulate cooperation between the United States and Mexico. Prior to this study no published data were available regarding Zapata bladderpod abundance, phenology, or spatial distribution with respect to conspecifics or other plants. During an exhaustive search of the tract in July 1997, Zapata bladderpod were marked to determine where the largest concentrations occurred. A systematic random sampling method was used to distribute 30 sampling plots across the Zapata bladderpod population area. Zapata bladderpod surveys were conducted on 31 July 1997, 15 March 2001, 15 June 2001, 10 September 2002, and 22 September 2003. TABLE 1--Results of analyses of variance comparing the three descriptors of vegetation between treatments at Cuellar, Starr County, Texas, or comparing them among the other three sites in Starr County, Texas, used to assess ecological relationships of the Zapata bladderpod Physaria thamnophila. After the Missouri bladderpod was listed as endangered, the Missouri Department of Conservation (MDOC), The Nature Conservancy, and the U. Although not glitzy or exciting, work to save the Missouri bladderpod has been coordinated and consistent. We have been able to secure similar management agreements for the Spring Creek bladderpod with two Lebanon-based corporations, Cracker Barrel Old Country Store, Inc.
Zapata Bladderpod (Lesquerella thamnophila) This herbaceous perennial in the mustard family (Brassicaceae) is currently known from only four locations in Starr and Zapata counties, Texas. Zapata Bladderpod (Lesquerella thamnophila) Known only from Zapata and Start Counties in southern Texas, this plant is a silvery-green herbaceous perennial in the mustard family with sprawling stems and yellow flowers.